In order to commemorate the 70th anniversary of Mother Teresa’s Missionaries of Charity and to celebrate her sainthood, the DHR in association with the members of missionaries of charity from Loreto, St. Joesph and others organised a memorable programme at Darjeeling station. The program was followed by flagging off ceremony of new Steam Joytrains between Darjeeling and Ghoom. 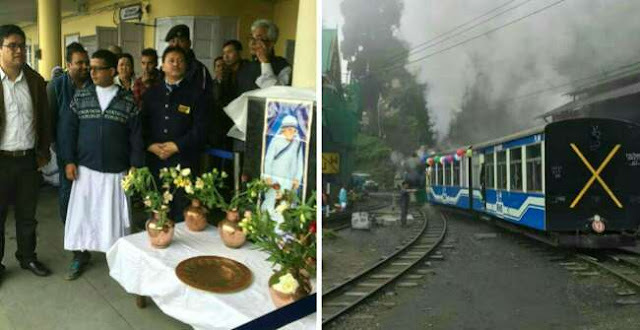 The missionaries and the railways participated in mass prayers at Darjeeling station and in the special train ride especially organised between Darjeeling and Ghoom in memory of Mother Teresa. The ride was sponsored by DHR for the underprivileged children, old age people and the missionaries. Ever since it opened in 1881 the Darjeeling Himalayan Railway has been a very special railway. In 1946 it became even more special when mother Teresa made a historical journey to Darjeeling by DHR. On 10 September 1946, Teresa experienced what she later described as "the call within the call" while travelling by DHR train to the Loreto convent in Darjeeling from Kolkata for her annual retreat. This was probably the first time such a memorable event had been organised by the DHR. This created a vast publicity, awareness and historical link between DHR and Teresa’s missionaries of charity locally, nationally and internationally.